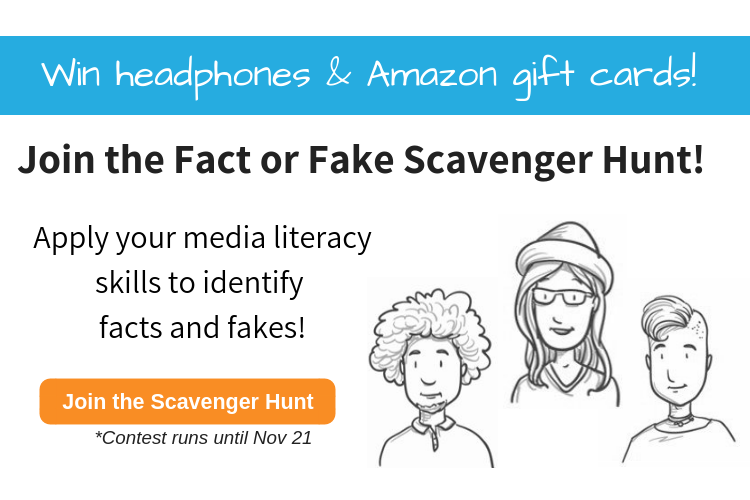 In celebration of Media Literacy Week (Nov 5-9), this scavenger hunt contest invites students to apply their media literacy skills to identify facts and fakes. As students take the scavenger hunt quiz, they will be given clues to find Listenwise stories related to the contest theme. Once they have found the right stories, they will need to listen to them carefully and hunt down the answers to the related questions. 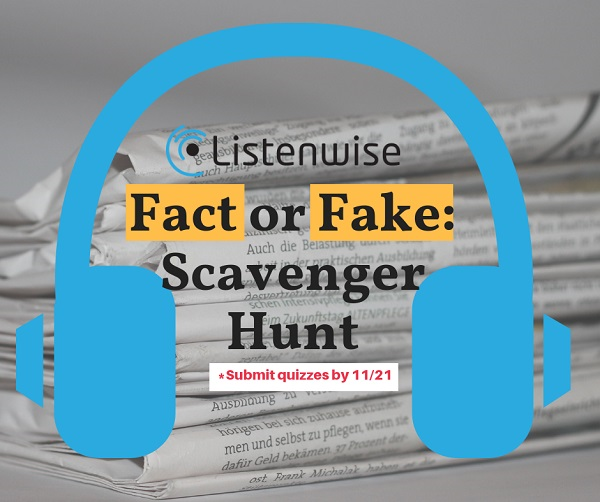 Participation in this scavenger hunt will offer students an opportunity to explore Listenwise, learn about media literacy, and, most importantly, have fun! Make sure you have a Listenwise Premium account or the 30-day free trial so you can assign and submit student quizzes in order to participate. You can access the quiz any time from Wednesday, November 7 through Wednesday, November 21, but be sure to submit your answers before 11:59 pm EST on November 21st to be entered into the contest. Prizes will be awarded to the highest total class quiz score, the highest total student submissions from one teacher, and one random lucky winner! Win headphones for your whole class and an Amazon Gift Card! First prize is a set of classroom headphones and a $100 Amazon gift card. Second prize wins a set of classroom headphones and a $50 Amazon gift card. Third prize is a $50 Amazon gift card. Listenwise helps teachers use stories from public radio in their classrooms. To find more stories and lessons for your middle and high school ELA, social studies, and science classrooms you can sign up for a free Listenwise account! Teaching Strategies for using Listenwise.